These delicious Pumpkin Cream Filled Whoopie Pies are the perfect seasonal treat! Filled with creamy pumpkin goodness, it is a sweet treat that you won’t want to say no to! I am so in love with these Pumpkin Cream Filled Whoopie Pies. Well, firstly, I am so in love with pumpkin! It’s funny how it becomes the staple food in everyone’s house during the fall. I’ve made so many pumpkin recipes lately, I literally can’t get enough of it! The pumpkin cookies are so soft and chewy, with a hint of vanilla – these can be perfectly enjoyed on their own! I made these cookies as part of a recipe test for crunchy pumpkin cookies and found that they tasted just as good in both textures. The great thing about these pumpkin whoopie pies is they aren’t made from conventional, processed flours. I made use of almond and tapioca flours, of which you can easily find in your grocery stores or on Amazon. This makes them gluten-free and paleo! In addition to this being a paleo and gluten-free recipe, I wanted to make the pumpkin cream filling dairy free so I used coconut cream – this is basically the thick part of a can of coconut milk, placed in the refrigerator overnight. This mixed with some honey and pumpkin puree gives you a sweet and velvety pumpkin cream. I love making healthy gluten free, paleo and dairy free desserts and treats because it gives me hope that I’m not only nourishing my body (and also protecting my waistline) but I’m also allowing myself the pleasure of indulging too! I mean, what’s life without a little pleasure, right?! 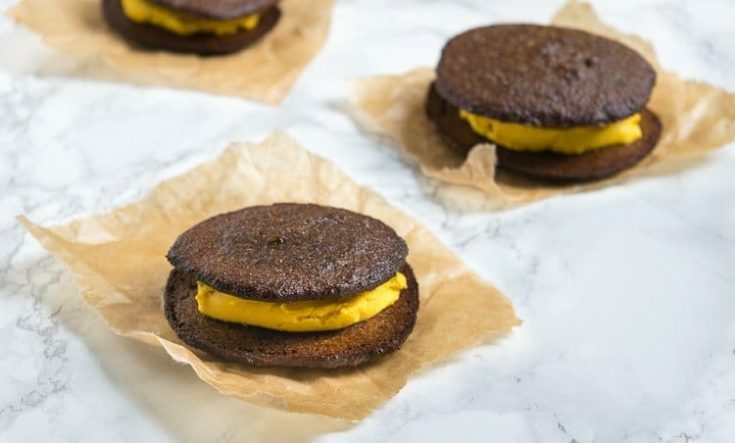 If you’re making these Pumpkin Cream Filled Whoopie Pies for a party, be sure to make a couple of batches of the cookies so you’ll have plenty for your guests – you may also need to top up the pumpkin cream filling! In a large mixing bowl, mix together your coconut oil, pumpkin, honey and vanilla till smooth. Sieve in your flour and mix till incorporated. Bake for 15-20mins, till browned and the centre of the cookies bounce back when you apply pressure. Mix together your pumpkin cream filling in a bowl and place in the fridge until ready to use. Once cookies are done, let cool completely before adding the pumpkin cream filling. Construct your pumpkin whoopie pies, serve and enjoy! Whitney is a contributor here at All She Cooks. She is the paleo food blogger behind WhittyPaleo.com. She posts up luscious recipes that aim to help you develop a healthier relationship with food - forever! You can find her and her recipes on her website, Facebook, Pinterest and Twitter.